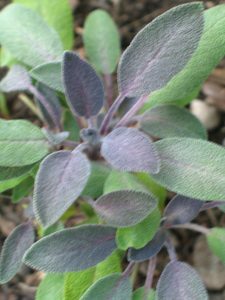 Perennial herbs such as sage, thyme, lavender, rosemary, oregano, winter savory, and mint have medicinal use as well as culinary. This is certainly not a complete list of the possible perennial herbs you might want to grow. These herbs are also good at repelling pests. Many people are interested in the medicinal use of herbs for a variety of reasons from concern about “traditional” medicine to concern about emergencies where medical personnel and supplies may not be readily available. Herbs also can provide some interest to food when fresh food may not be so readily available – especially if you are already in the habit of eating food that is not bland. Whatever reason you have for growing herbs if you plant and begin using them soon you will already be familiar with their uses when you may need them. Perennial herbs once planted can give pleasure and usefulness for many years. However, the woodier perennial herbs grow slower at first so if you get them planted you will be able to harvest sooner. Why wait to plant them? Maybe you have just been putting it off. Or, don’t know where to plant them or where to purchase plants? Search this site for the herb you want to grow to find tips for growing locations. My books also provide information about how to grow and use a variety of herbs. If you need help with where to buy them many local nurseries sell herbs or you can check the resources on this site on in the back of my books for some online nurseries that I like. Are you renting or otherwise not in a permanent location? Plant in pots for easy moving to a new location or ask your landlord about improving the landscape with some herbs. You may get to learn about and enjoy some herbs with a little labor and no expense to you. What should you start with? Which herbs do you use now – even in the dried state? Sage, thyme, lavender, and rosemary are the slower growing on the above list so you may want to begin with some or all of them. Oregano and mint are faster growing. I would begin with plants for all the herbs listed. Some are only available as plants. Others grow slowly enough that a head start using a plant may speed things up considerably. 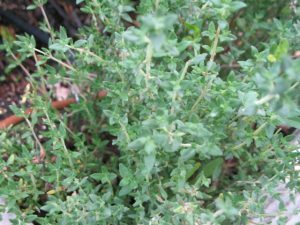 Oregano is so variable that I think it is best to smell the plant before you buy which you cannot do when planting seeds. Are there other reasons you have delayed growing your own perennial herbs?